Tara, the oldest winery in Henderson County, is owned and operated by the Pierce family. Upon entering the grounds, you'll notice the stately Murchison home, constructed in the 1880's. Be sure to check out all of the wines at Tara, but don't miss the ones with the paintings on the labels! 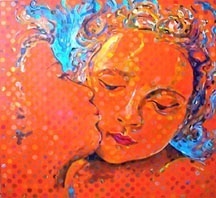 This painting, one of my early ones, measures 40"x44". It is titled "Sunday Kind of Love." It is part of the private collection of Caroline Black. 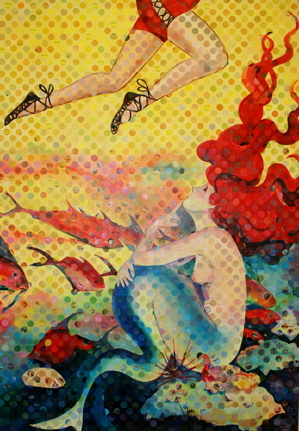 This painting is titled "Melusine Waiting." This large painting measures 48"x72". It is in the private collection of Rachel Tobes.